Use this page to buy a support/updates extension for an existing, full (i.e., paid for) copy of Breeders Assistant for Horses, Commercial Edition. You may be entitled to a free upgrade to the current version (5.24), depending on when you first obtained Breeders Assistant and whether your period for support/updates is still valid. If not, place your upgrade order here. Note that if your existing support/updates date has not yet expired, the additional period you choose below will extend your existing support/updates expiry date. Please fill out all sections below then click the 'Buy Now' button. You can download the product, or have it sent on CD or a USB stick. If you order a CD/USB you can still download in advance of the CD/USB arriving. All purchases are subject to the Terms and Conditions listed below. To give you the correct pricing and ordering options we need to know where you live. Choose whether to receive a CD/USB, and select 1 or 3 years of support/updates. All support+updates extensions automatically include an installation code for the latest version of Breeders Assistant. Would you like to receive an occasional email from us whenever an updated version of your product has been released that includes new features? Updates are free during your period for support/updates. You will receive at most 4 emails per year and you can easily unsubscribe whenever you like. Are you sure? We recommend that you subscribe to the email newsletter as this is our way to keep you informed about changes to the product, new features, etc. You will receive at most 4 Breeders Assistant email newsletters per year and you can unsubscribe at any time. You can find this by opening your copy of Breeders Assistant, and then selecting About Breeders Assistant from the Help menu. A window opens containing various pieces of information, one of which is your serial number which is a long string, e.g. 'TUKXX1234500000-PACTPR2-M-G-000000-1234ABCD'. The bit we need in order to process your order is the text up to the second dash e.g. in this case it would be TUKXX1234500000-PACTPR2. Would you like to receive at most 2 emails per year with news and information about our other pedigree software and related animal database products? These emails would be limited solely to news about Tenset products. Your email address will never shared with anyone else and you can easily unsubscribe whenever you like. Note these would be in addition to any product update emails you may receive (see above). Enter any other information here. Please state whether you would like to receive occasional Breeders Assistant update information emails. 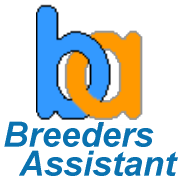 You can find this by opening your copy of Breeders Assistant, and then selecting About Breeders Assistant from the Help menu. Please state whether you would like to receive occasional marketing emails concerning our other products. Click 'Buy Now' to send your payment to Tenset Technologies Ltd via PayPal. Please note that you do not need to have a PayPal account to do this; just use the 'Guest checkout' or 'Pay with a debit/credit card' option without any need to create a PayPal account. This software is sold subject to an End User License Agreement (EULA). By purchasing through this web page you are accepting the terms of this license. We process orders during UK business hours. Once you have made your purchase we will contact you by email with installation instructions, including any install code(s) that you need for the full version of the product. If you place your order Monday-Friday during UK business hours (9-5.30 UK time) there will be a delay of a few hours at most before your installation codes are sent, because we process orders manually (i.e. by a human). Orders placed at weekends or on UK public holidays may not be processed until the next UK business day (Mon-Fri). If you are ordering from outside the UK please remember that sometimes we have public holidays that you do not. When you buy any option that includes a CD or USB stick we will send you one CD/USB, containing the current version at the time of your order. When updates to which you qualify are made available you will be able to download them. We do not send you a CD or USB stick every time there is an update. However you can purchase an update on CD or USB stick if you are within your current support/update period. For details of our returns/refund policy, please see the Frequently Asked Questions. We reserve the right at our sole discretion to cancel any purchase prior to delivery or issuance of software installation codes. In such circumstances a full refund will be made of the amount paid in the cancelled order and we shall be under no obligation to disclose our reasons for cancellation. Depending on when your period for support/updates expires you may be entitled to a free upgrade. If you are ordering a user modifiable genetic configuration, please enter your breed in the 'Other Information' box. To give you the correct pricing and ordering options we need to know where you live. If you live in the European Union but NOT in the UK, please read this important notice. Choose either 1 or 3 years of support. Downloaded applications are not available to EU customers outside the UK; we will only supply this product on CD or USB stick (no download) for customers resident in these countries. We process orders during UK business hours. Once you have made your purchase we will send you an email confirmation of your order. The product, including your installation code(s), will be dispatched to you on CD/USB using standard airmail post. We regret that, due to changes in EU VAT regulations commencing 1st January 2015, we no longer supply downloaded products to customers in EU countries other than the UK. We will send you one CD or USB stick, containing the current version at the time of your order. We do not send you a CD/USB every time there is an update. If you want to get an update on CD/USB, and you are within your current support period, you can order a new CD or USB stick.